preserved permanently in the Heritage Gallery. Chassis # 7999. 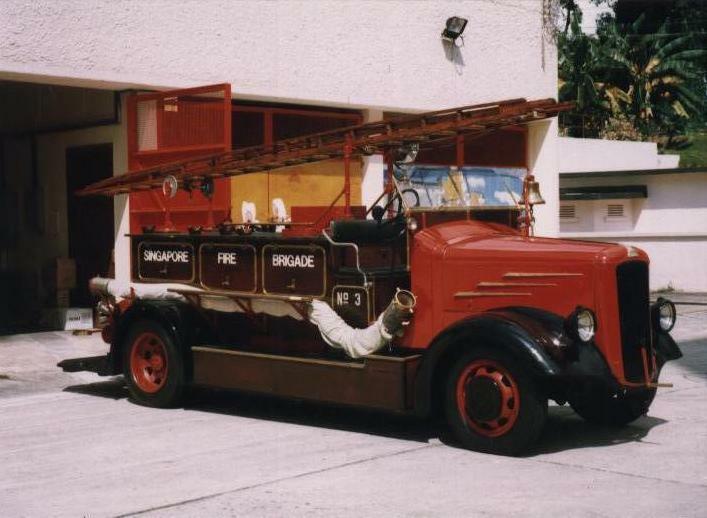 This appliance is criticised by Singapore firemen who used it.Because some firemen who sits at the sides usually fell down when the Dennis is driven through bumpy roads/streets. Added by Bomba Boy on 22 February 2007. Added by Fire995 on 26 February 2007. I'd like to hear from a firemen from the 30's and 40's when this was in operation. Any still alive? Added by NC on 27 February 2007. Frank, Bomba Boy is right again, when I was reading some material on the early years of the Singa's Fire Brigade it was reported that in the rush by some of the enthusiastic drivers to get to the scene of the fire, it was not uncommon for firemen to be thrown from their seated positions along the sides of this particular appliance due to some of the rough roads and tracks, and they had to pick themselves up off the ground and run like heck to catch up to the engine if it had slowed for them, or jump a rickshaw! Nc, I believe they were taken out of service around 1955/6 and at that time they might have been spare appliances or for training. So it's more then 50 years ago! the most old timers I met joined in the 50ties/60ties and the light 6's were gone by then. Pavel, did you read it in the singapore fb anniversary book? Added by Fire995 on 27 February 2007. Frank, I read that information when I was up at the Heritage Gallery last year in May for the Singapore Cup. I went there for a five minute visit at the Central Fire Station and resurfaced two hours later, and I hadn't even got to the second floor!! Added by Pavel Zaremba on 01 March 2007. Added by Fire995 on 01 March 2007. What i know is that the SCDF former Light Pumper (later replaced by Red Rhino) is on display at the SCDF heritage gallery.What a nice thing if i can see the Dennis RS cut off. Added by Bomba boy on 04 March 2007.